I picked up this book to read a chapter or two. The next thing I knew several hours had passed by and I had finished the book. Roanna Rosewood is an excellent writer and she certainly hooked me from the beginning of the book. 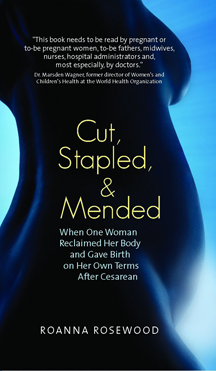 I had expected another book focusing on the anger and disappointment that many women feel after a cesarean birth. (That’s not to say that those books are not valuable; but I’ve already read more than one.) This book is so much more – a celebration of womanhood, female friendships, and yes, pregnancy and birth. I can’t say whether her first two cesarean births were necessary or not. She planned home births with midwives. She labored for many, many hours and went reluctantly to the hospital upon the advice of her midwives. I don’t want to say too much more because I don’t want to spoil the suspense (yes, suspense) in the book. Although I am about as left-brain as they come, I loved her descriptions of the many alternative practitioners and therapies that she tried. Her descriptions of her relationships with her husband and children were funny and heartwarming. I applauded her stories and attitude towards their family bed. The only people who I think may not like her book are those mothers who have to have cesarean births because of physical and medical problems. But I hope that those mothers will understand that Roanna was at peace with the idea of a third cesarean when she was pregnant for the third time. She had arrived at a place in her life where the mode of birth no longer defined her. I am grateful that she shared her story in this wonderfully entertaining and powerful book. And, if I am ever in Ashland, Oregon, I look forward to having lunch at the family’s restaurant. Thank you for the review. I’m glad you enjoyed it and look forward to seeing you at my restaurant in Ashland.